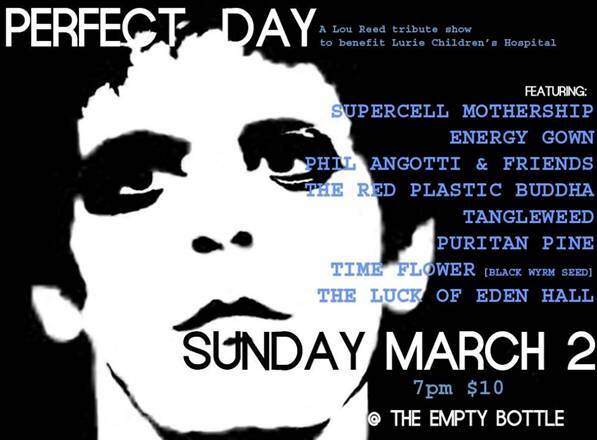 An impressive roster of Chicago musicians will take the stage on Sunday at the Empty Bottle to pay tribute to the late Lou Reed, with whom 99 out of 100 bands that play the Empty Bottle probably wouldn’t be around today. The benefit for Lurie Children’s Hospital will feature performances of the legend’s solo work and songs with the Velvet Underground by Supercell Mothership, Energy Gown, Phil Angotti & Friends, the Red Plastic Buddha, Tangleweed, Time Flower (Black Wyrm Seed) and those psychedelic giants the Luck of Eden Hall. The music starts at 7 p.m., and tickets are $10. A more frigid brand o’ fun will be had at the Bottle—or, more specifically, just outside on Cortez Street—on Saturday, with an event the club is calling “Music Frozen Dancing.” In proud defiance of looming snowstorms and the never-ending polar vortex, the party will feature live music, beer from Goose Island, coffee from Dark Matter, and chili from Bite Café. 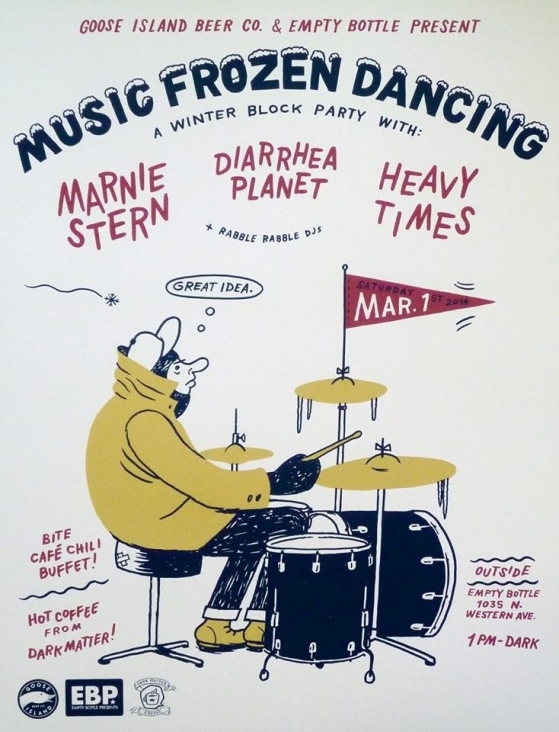 Performers include Marnie Stern, the Nashvile sextet Diarrhea Planet, and Chicago’s Heavy Times. Gates open at noon, the party lasts until dark, and admission is free. Updates can be found here. 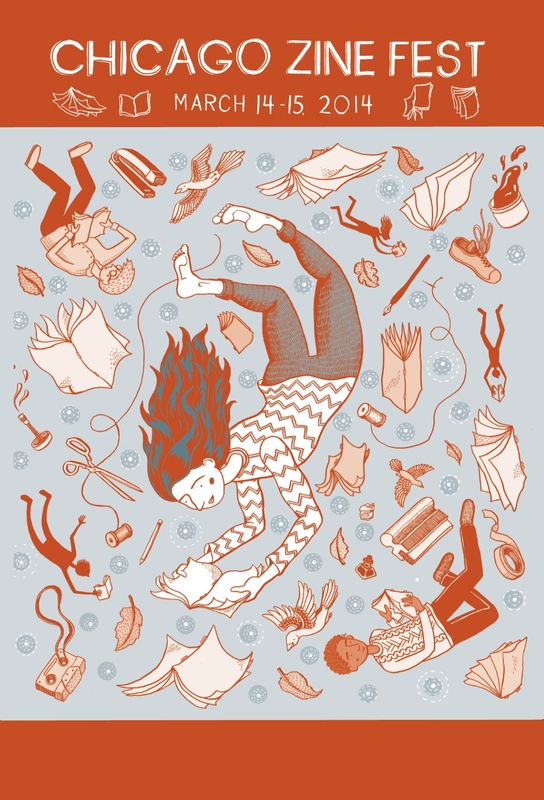 Finally, we all know how important zine culture is to the music world—and to thinking people in general—and the fifth annual Chicago Zine Fest takes place on March 14 and 15. Things kick off on Friday, March 14, at 1 p.m. with a panel called “In it for the Long Haul: A Discussion on Longevity in Zines” featuring Cindy Crabb, Tomas Moniz, Alex Wrekk, and moderator Liz Mason (manager of the invaluable Quimby’s Bookstore) at Columbia College’s Conaway Center in the Ludington Building, 1104 S. Wabash. (The event is sponsored by the school’s Center for Book and Paper Arts.) The fun continues Friday night at the Hairpin Arts Center, 2800 N. Milwaukee, with a Youth Zine Reading and an Exhibitor Zine Reading, followed by a dance party with music provided by CHIRP Radio. On Saturday, March 15, more than 200 zine editors will exhibit their publications, host workshops, and lead discussions back at Columbia’s Ludington Building. More info can be found here.